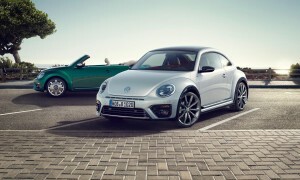 The VW Beetle has been given a stylish revamping and a new sporty R-Line trim. The motoring icon that has sold millions of models around the world, the VW Beetle has been given a stylish revamp and has a new sporty R-Line trim added to the line-up. The Beetle was reborn in 1998 and last given a thorough refresh in 2011 and now the stylish changes include a new interior and a sculptured body. VW say the changes will boost its appeal and it’s also available in Cabriolet and coupe formats including the crossover version, the VW Beetle Dune. Among the changes to the VW Beetle are larger indicators, sharper lines for the front bumpers and new fog lights surrounds; the overall look does give it a modern and sleek appearance. 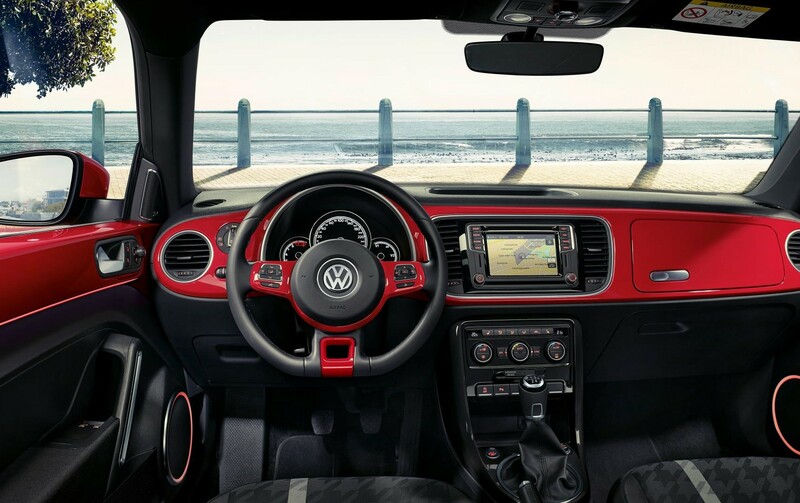 In the cabin, the Beetle has new panel lighting to give the instrument display a brighter appeal, there are also new dials and the dash has been restyled for the Design and R-Line version. There’s even new upholstery available and customers have the option of choosing various styling options. The VW Beetle R-Line will now replace the Beetle Sport and comes with the firm’s excellent 2.0 litre TDI diesel unit producing 150 bhp and this is mated to a choice of the six speed manual or automatic gearbox. To help deliver a smoother ride, the R-Line also has a new sport suspension and alloy wheels though there are new alloy wheel designs available at no extra cost. Standard equipment includes climate control, ambient lighting, parking sensors and cruise control. There’s also the option of a black styling pack which adds black alloy wheels and painted roof along with decorative trim stripes and the air intake grille is also painted black. Available to order now, the entry-level model is the VW Beetle with a 1.2 litre TSI petrol engine producing 105 bhp with emissions of 126g/km, two doors and manual transmission which will cost £16,820 OTR. The most expensive model is the VW Beetle Dune fitted with a 2.0 litre TDI diesel unit coupled to the firm’s automatic transmission with the engine producing 150 bhp and its emissions being 130g/km – the OTR price is £28,545. This entry was posted in Car Leasing, Cars, Family Car, New Cars and tagged vw beetle by Steve Lumley. Bookmark the permalink.